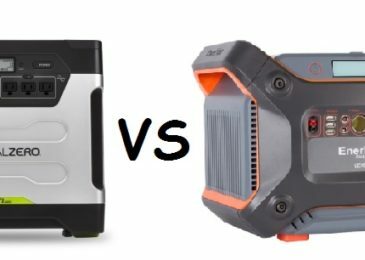 A brief review of three types of solar panels: Monocrystalline VS Polycrystalline VS Thin film Solar panels. 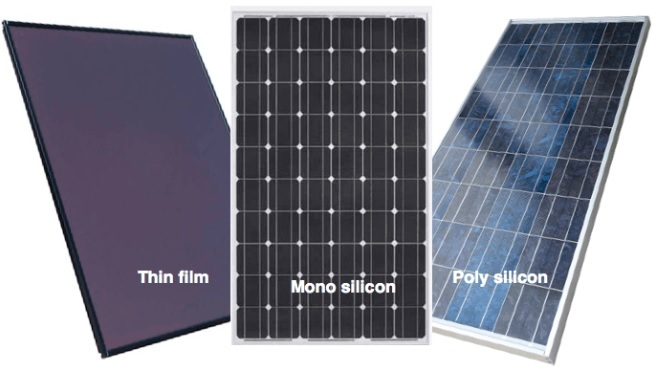 This article will present the three musketeers of the Solar panel world: Monocrystalline, Polycrystalline and Thin film solar cells. The first two are made out of crystalline silicon and are most common material for making solar panels. Thin film is totally different, less efficient but it excels in low light conditions. 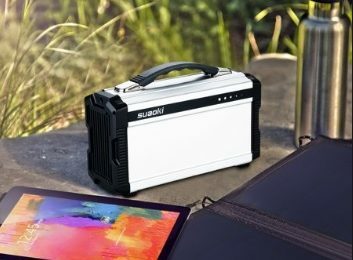 Of these three technologies this is the most developed one. It is also the oldest and is made out of a single continuous crystal structure. You can easily recognize it due to the solar cells which are in single flat color. They are made using the Czocharalski method which result in large cylindrical ingots (molten silicon which forms a solid crystal structure). The ingots are then sliced and made into a silicon wafer used for the solar panels. High efficiency – they convert more than 22% of sunlight into power. Space efficient – even though they have the largest energy input, these solar panels require the least amount of space. 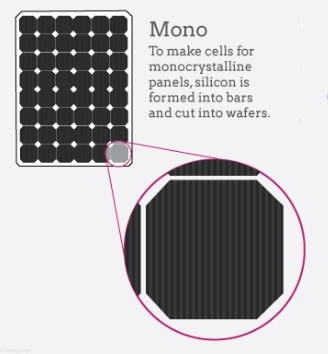 Long lifespan – Most solar panels made out of monocrystalline have a 25 year warranty. This is due to the fact that crystalline silicon is a very stable and inert material. 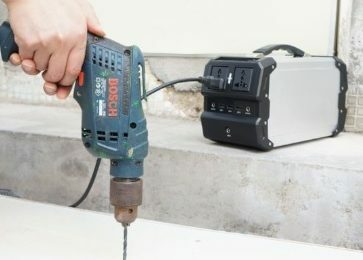 More efficiency in warm weather – It is known that if there is no sunlight there is no power. However, this fact is less severe in monocrystalline panels. Pricing – monocrystalline solar panels are the most expensive ones. Basically, they are for those who can afford them. Waste – there is a large amount of waste silicon. This is a new technology even though it is thought to be inferior to Monocrystalline cells. 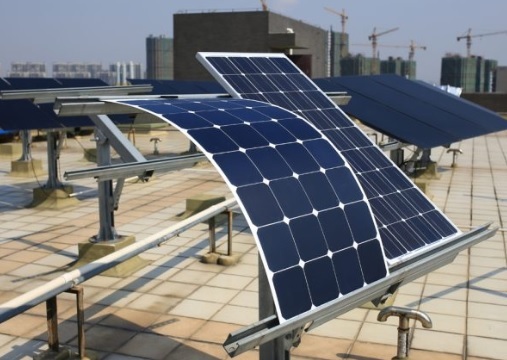 The method of production is cheaper and therefore the solar panels whit polycrystalline are less expensive. The efficiency is slightly lower than monocrystalline but these solar panels dominate the residential market. 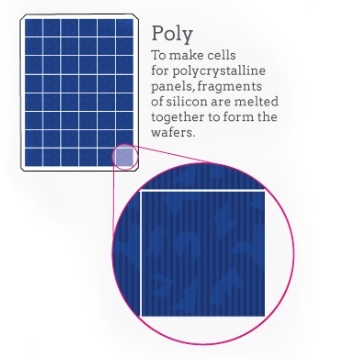 Cheaper – the process of making polycrystalline silicon is cheaper and much simpler. Waste – the total amount of waste silicon is much lower compared to monocrystalline. Lower heat tolerance – they have a lower heat tolerance than monocrystalline solar panels. Heat increased output will fall less. Efficiency – they are less energy efficient than monocrystalline solar panels. They convert around 14-16% of sunlight into energy. Less aesthetically pleasing – the speckled blue color of the silicon. Space efficiency – they cover up a larger surface. These solar cells are recognizable due to their solid black appearance. They are made by placing a photovoltaic substance (e.g. 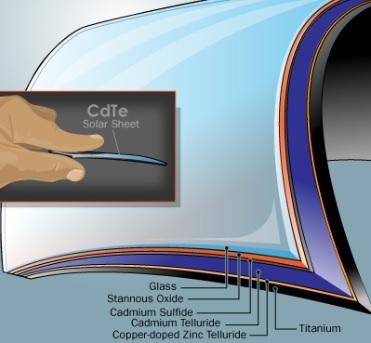 Amorphous silicon, Cadmium Telluride, Copper indium gallium selenide or Dye-sensitized solar cell) on a solid surface similar to glass. The method of production is the cheapest one yet, and the thin film solar panels are consequently cheap. Mass production – cheap and simple manufacturing. Aesthetically pleasing – the solid black color makes them look very appealing. More applications due to the fact that they can be made more flexible. Efficiency – shading and high temperatures have little impact on the performance. Efficiency – They convert around 10-16% of sunlight into energy. Space – even though they are cheap, they require a lot of space and are not suitable for everyone. 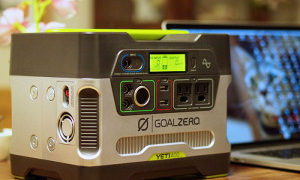 Shorter warranty – they degrade faster than the crystalline solar panels.